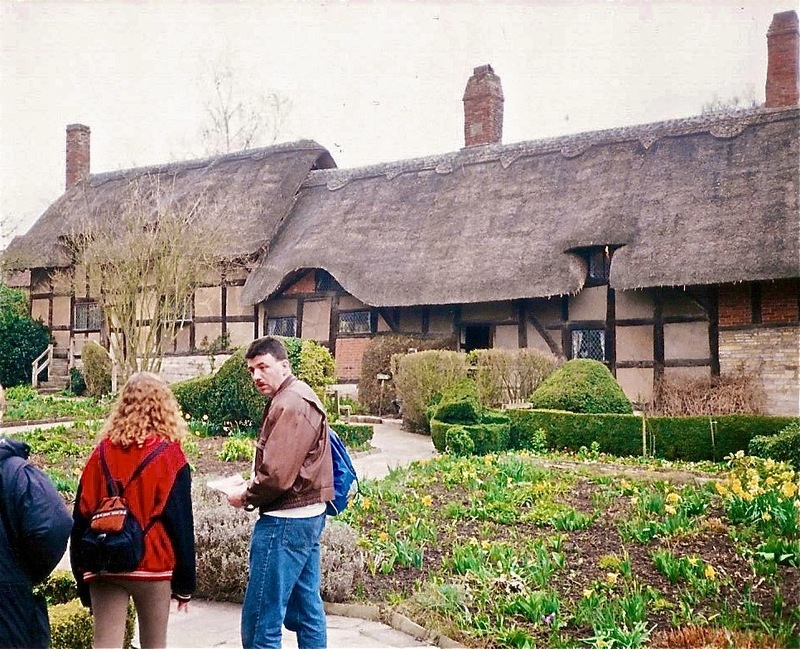 In 1995, the lovely Robin and I traveled with our children, Aubrey and Aaron, to that “green and pleasant land” that gave birth to Shakespeare.We were hosted by our dear friends Nigel, Rachel, Samantha, Carlene, and Dathan Horridge on a tour of England and, while there, of course (of course! ), we visited Stratford-Upon-Avon, the birthplace and hometown of William Shakespeare. That’s me above–no, really, that’s me, the silly American in the trench coat with a camera hanging from his neck, standing to my daughter’s left with Aaron hiding behind us and Nigel just in the picture to the right. That’s Aaron above, however, who operated the movie camera while I took stills, with Shakespeare’s birthplace and first home there in the background. The Bard grew up here and played here. He ate meals in the hall and slept and dreamed in those rooms. He spent the first five years of married life in this house with his new wife, Anne Hathaway. Shakespeare’s house. SHAKESPEARE’S HOUSE. Did I mention: SHAKESPEARE WAS HERE? THE Shakespeare? And the site of the large house he built later in life, New Place, is marked with beautiful gardens, where my daughter roamed (below). Not only that, but previous visitors to this spot have included Charles Dickens, John Keats, Walter Scott, and Thomas Hardy. I didn’t happen to recognize any of them while I was there, but neither did they recognize me, so I guess we’re even. And, of course, included in our day at Stratford-Upon-Avon (I just like saying that) was a visit to Anne Hathaway’s cottage where, obviously (judging from the photo above) Aubrey was saying something utterly baffling to Nigel. Although his face always wears that look, so maybe not. But did I happen to mention: SHAKESPEARE WAS HERE! And I was, too. Though it all seemed so hard to believe, and it grieves me that I haven’t yet been back. But some day. Some day, my friend. 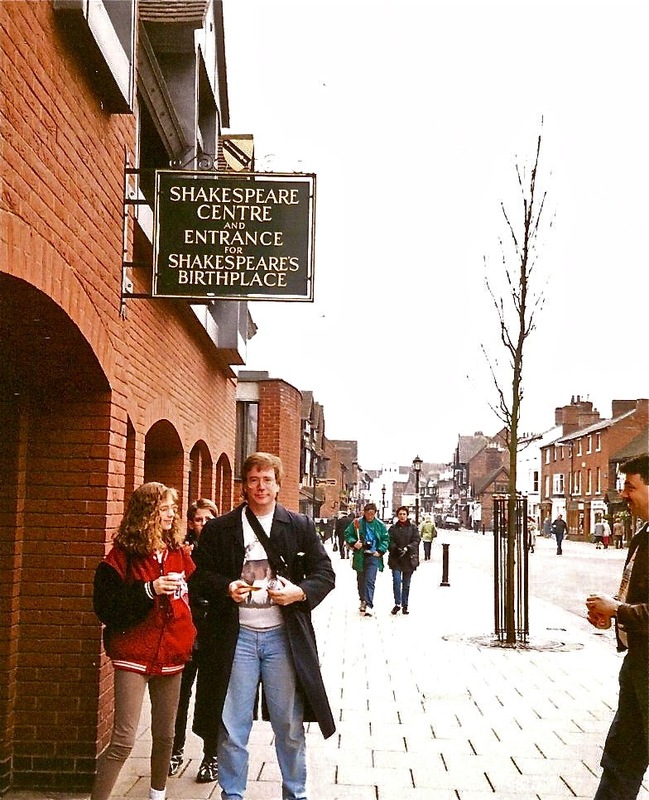 This entry was posted in Bard and tagged England, shakespeare, stratford, Stratford Upon Avon. Bookmark the permalink.